Start your day luxuriously every day with the 19 inch WaterVue waterproof online TV for bathrooms. Get the day’s weather and latest news stories during your morning shower, or catch up on your all-time favourite films and TV series while enjoying a hot soak. With a full HD TV screen and seamless streaming from Netflix, BBC iPlayer, YouTube and other online apps with the Amazon fire TV stick, this waterproof smart TV opens up a whole world of possibilities. 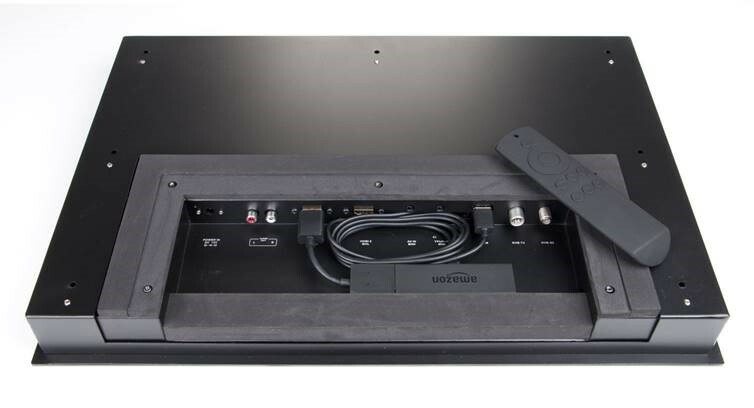 The WaterVue 19 inch Smart TV has cut-out dimensions of 474mm x 318mm x 48mm and front dimensions of 490mm x 335mm x 3mm. The model is an attractive, slim design that’s easy to install and brilliant value for money. It sits flush to your tiles for a professional finish and, at just 19 inches, is ideal for bathrooms of all sizes! The waterproof TV offers an HD LG LED panel with fully integrated vibration speakers, which enables it to deliver fantastic sound quality. To ensure you have the best viewing experience, the IP65 rated waterproof model has mist-free technology, so you’ll never need to wipe the glass screen when it’s on. Perfect! Enjoy the best entertainment on offer with video streaming services Netflix, YouTube and Amazon Prime Video and more. So you can unwind and relax to your favourite music and films. 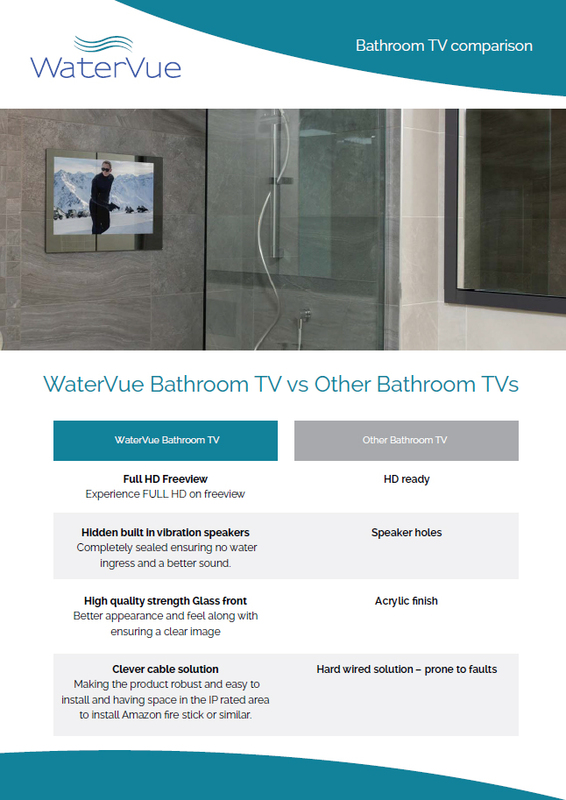 At just 19 inches, this WaterVue TV is brilliantly compact, making it affordable and perfect for small bathrooms and ensuites! 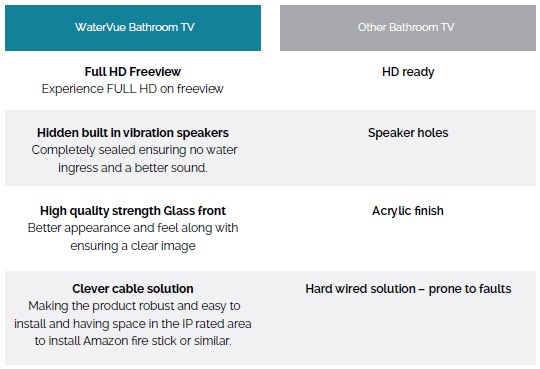 For more information about the 19 inch waterproof online TV for your bathroom, don’t hesitate to contact our experienced and knowledgeable team. Call 01777 322003 or order online today and enjoy next day delivery when you order before 2pm in the UK.